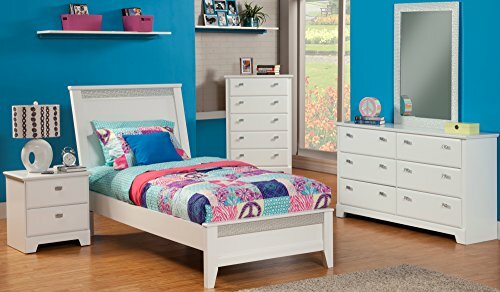 The Hailey bedroom collection is a transitional style White bedroom set with a mar resistant white laminate finish with polished silver nugget moldings. The nicely scaled bed with tapered legs with polished silver nugget moldings on both the headboard and footboard. Optional under bed lighting is available to give the bedroom a fun and unique look. Cut out bases, ogee edge drawer fronts and under top moldings give the dresser and nightstand a great look. A mitered picture frame mirror in polished silver molding can be hung on the wall vertically or attached to the dresser vertically. Additional features include custom style polished silver finish nugget hardware, French Dovetail drawer construction, smooth operating steel roller glide drawer runners and extra sturdy 3 mm MDF case backs and drawer bottoms. Assembled in the USA. Set contains Twin Bed, 6-Drawer Dresser, Mirror and 2-Drawer Nightstand. Product Materials: MDF, Laminate, Wood, Glass Bed is available in two sizes: Twin or Full Bedroom Set Includes: DRESSER 60x16x33 MIRROR 41X01X29 NIGHT STAND 22X16X22 .